HAMLET: How About Machine Learning Enhancing Theses? We usually think of subject headers as a list — “here are the five subjects assigned to this book”. However, we might instead think of them as a vector: “for each of the millions of possible subject headers, assign them a Boolean depending on whether they describe this book”. You can imagine there might be more than two concepts, and therefore instead of a two-dimensional graph you could have a three-dimensional space (or four-dimensional, or four-hundred-dimensional…) Each document has a vector, with one number per concept, that pinpoints its coordinates in that space. Thinking about documents in this way gives you lots of interesting options. 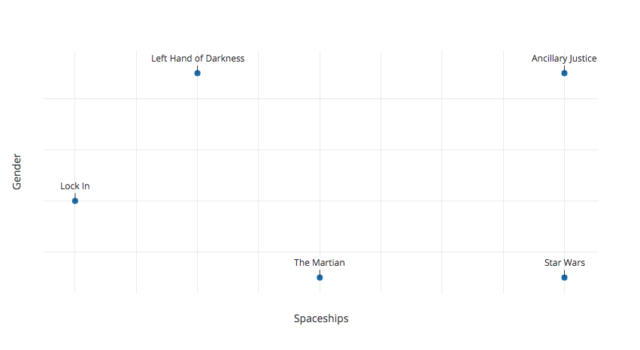 For instance, you can ask questions like, “Is Ancillary Justice more like The Martian or like Star Wars?” And you can get an answer that’s literally a number — you can compare the distance between each book. You can also ask questions like “What do you get if you take Star Wars and add more gender?” or “If you start with Ancillary Justice and subtract out the stuff that’s also in Left Hand of Darkness, what book is most like the parts that remain?” Because these questions all have mathematical meaning, computers can calculate their answers. Doc2Vec figures out the concept space as it goes, and it likely doesn’t map to meaningful human concepts like “gender” or “spaceships”. Andromeda Yelton is the lead for hamlet. 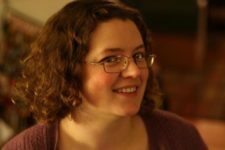 She’s a software engineer at the Berkman Klein Center (formerly at the MIT Libraries) and the 2017-2018 President of the Library & Information Technology Association. She wrote most of the code: the machine learning; processing pipeline to extract fulltext and metadata from dSpace; and the front and back ends of the Django app. 🌈 Helen Bailey, whose dSpace extraction work I adapted, and who is hamlet’s once and future data visualization wonk. Its code lives on GitHub and it’s hosted on AWS. This article originally published at THE BUZZ – Berkman Klein Center for Internet & Society at Harvard University on Sep 27, 2018.